Fantasy freaks: DraftStreet.com has created an exclusive safe haven in which Deadspin readers can participate in a one-night NBA fantasy league. 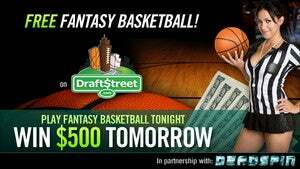 The salary cap contest happening tonight is Deadspin's inaugural foray into DraftStreet-land, and there's $500 cash up for grabs. Make Deadspin the clearly superior NBA fantasy league by signing up here, for free. Then assemble the best team based on the price tags of available players without going over the salary cap of $100,000. Teams must consist of 2 forwards, 2 guards, 2 centers, and 2 utility players (can be a guard, a forward or a center). Dirk Nowitzki will only cost you $14,230. Ever since he has come back from injury he has looked like the guy that ran the table against Miami last year. You can snag Randy Foye at the bargain price of $7,787, thanks to Chauncey Billups being out for the year. The top 9 finishers will receive the following payouts: $150, $105, $75, $55, $40, $30, $20, $15, and $10. You can adjust your roster up until the contest starts tonight, Wednesday February 15 at 7:00pm ET, at which time roster will lock and the Live Scoreboard will appear. Click here to sign up for free and register for the Deadspin $500 Freeroll on DraftStreet.com.